Reduce the oven temperature from 300 to 275° F.
Cook them for 3 1/2 hours in the oven (baby backs take 2 1/2 hrs). You can cook them even longer in the oven if you like but they are very tender after 3 1/2 hours. 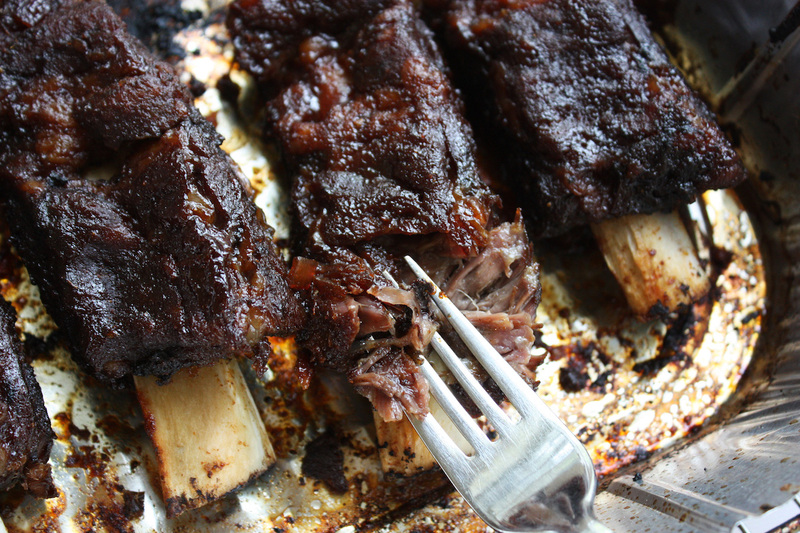 18 Comments on "Fall Off The Bone Beef Ribs"
Thank you for so many tempting, alluring recipes. I am anxious to start trying them in my own kitchen. Please, will tell me where I can find the recipes for your dry rub and your BBQ sauce. I have spent over 2 hours going from suggested site to the next to no avail 🙁 HELP :). I would love to surprise my family baby back ribs AND also home made garlic bread 😀😁. Reading at your site I recognize a very sweet, loving spirit in you. The LORD bless you. Ijust found ur site and I tried to subscribe to ur news letter coze I love the way you cook and all your site, however I couldn’t and I would appreciate if you would help me in this matter. We added you to the subscriber list. Don’t look for any emails soon – I only send about one a month. Hi Jenny. I love your videos in your beautiful kitchen and wish you’d make more videos. As far as the silver skin goes, I find that once you get it started you can remove the rest of it by pulling gently with a dry paper towel. usually it comes off pretty easily but you must pull slowly otherwise the skin will rip. I was never able to remove the silver skin either…until I learned about the dry paper towel method. Works every time! I made your ribs the original recipe and they were wonderful. I also used prime rib bones and they were fab! Will give this recipe a go too.Thanks. good day cooks and fans of wonderful food!! I am a cook in a busy restaurant and have found a decent way to remove that silver skin on the back side of the ribs. I might do 6-8 racks of ribs in one oven, and remove that (too chewy) layer of connective tissue on the back. Your family and guests will not know why your ribs are so good, but they’ll be back for more! Turn your ribs over, grab a salad fork, the kind you eat with, and poke it between 2 ribs, under the tissue on one end or the other, put your thumb over the fork tine and lift. Work it around a bit, loosening the membrane until you can get the whole tine under the membrane and it will pull off in one piece. It’s tough and will take some work, but you’ll see persistence pays off. Rest assured they will come off, I’ve never put a rack of ribs in the oven with the skin, and they all come off even when you think it won’t. Persist, and pull it off. The trick is not to tear it, while working the fork under the membrane so you can get a grip. Jennys recipes are always tasty, I know because I grew up in a house-hold where we ate all of these foods daily. My grampa Grabowski did lots of the cooking. Try her gnocchi recipe, it’s awesome! thanks Ms Jenny, for your work and recipes. They’re always a hit and topic of conversation at dinner time. Thank you so much for sharing this tip. I have directed people to look here for your advice. Just sharing a little tip. I use a small sharp knife and run it around the end rib under the skin. once there is something to grab, use needle nose pliers. grip it and rotate it a few times and then you can pull it all off in one piece. When will you have videos on facebook?